Here at Induna Stables there are 60 boxes which are a combination of American style barns and traditional loose boxes. 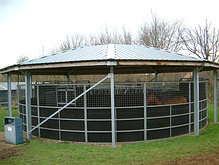 In addition there is a covered four bay horse walker, a lunge ring and an all-weather trotting circuit measuring one furlong round. 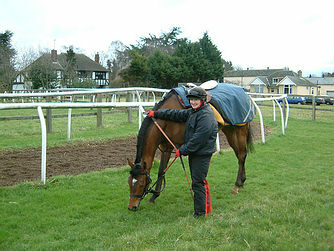 Horses can also relax in one of our five turning out paddocks after racing or a searching gallop at home. 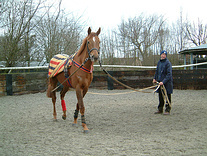 We also have the use of an indoor school so that horses can exercise even in inclement weather. Our grassed paddock enables horses to relax and have a pick of grass post exercise within the confines of our own property rather than use the wide-open spaces of the Heath. 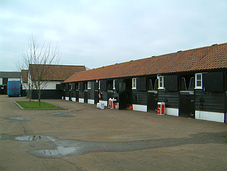 The three bay starting stalls in the paddock allow us to school horses through them here first before going on to use the Racing Stalls on the Heath. Also on offer is a veterinary examination area. 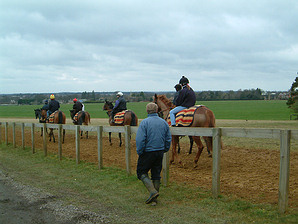 Induna Stables is well positioned and allows easy access to all the best gallops that the world famous Newmarket Heath has to offer i.e. Warren Hill, Limekilns and Across the Flat Gallop.